Koninklijke Racing Club Genk is a professional football club from the Belgian city of Genk; an industrial city in Limburg, close to the southern Dutch border. The football club was formed in 1988 following a merger between local rivals KFC Winterslag and K Waterschei SV Thor Genk. FC Winterslag had been formed in 1923, becoming KFC in 1958 when the Royal prefix Koninklijke, was added to their title. After competing in regional football for several decades Winterslag were promoted to Division II in 1972-73. The club were promoted to Division I in 1973-74, but suffered relegation just one year later. However, the team regrouped and went straight back up to the top flight at the first attempt. A fifth place finish in 1980-81 was as high as Winterslag would reach under coach Robert Waseige, before they were relegated once more in 1982-83. The 1986-87 season saw KFC finish as Division II runners-up, from where they won the play-off round and win promotion. The 1987-88 campaign was the last under their independent status, which ended in a fifteenth place finish before they merged with Waterschei Thor. K Waterschei SV Thor had been formed in 1919, playing in regional and then Division II football for several decades before being promoted to the First Division in 1957-58. After consolidating their status, Waterschei finished in third place in 1959-60, before being relegated at the conclusion of the 1961-62 campaign. The club regained their top flight position following promotion in 1977-78, before going on to lift the Coupe de Belgique in 1980 following a 2-1 victory against K.S.K. Beveren. A second national cup success followed in 1982 with a 2-0 win against K.S.V. Waregem. The second triumph sent Waterschei on a tremendous run in the European Cup Winners Cup campaign in the 1982-83 season, as Red Boys Differdange, B.93 and Paris Saint-Germain were defeated before the Belgians were defeated in the semi-final by Aberdeen as Lárus Guðmundsson and Eddy Voordeckers starred throughout the run. The same season saw Waterschei involved in an infamous match in Belgian football history as it was found that the game between Standard Liège and Waterschei had been fixed. Belgian and Standard skipper Eric Gerets had offered cash to Waterschie players to fix the game. Standard won the match 2-1. Many of their players and management were given suspensions, while Waterschei’s Roland Janssen and Aimé Coenen were both suspended for sixth months following an appeal. Waterschei were relegated to Division II at the end of the 1985-86 season, where they remained until the summer of 1988 when they merged with KFC Winterslag and took up their top flight place as KRC Genk under coach Joseph Vliers. KRC were relegated in their first season before returning to Division I in 1989-90 via the play-off round. Aimé Anthuenis was appointed as head coach in 1995 as the team finished as league runners-up. The 1997-98 season also saw Genk finish second as well as lift the Coupe de Belgique with a 4-0 win against Club Brugge. Genk became champions of Belgium for the first time in the 1998-99 season; with the club returning to the cup final to collect the trophy once again with a 4-1 against Standard Liège in 1990 under the stewardship of Paul Theunis. A second league title followed with Sef Vergoossen as coach in 2001-02 before the team reached the group stages of the Champions League the following season. Hugo Broos took over the team in June 2005, but his spell wasn’t one of success despite the goals of Jelle Vossen. Broos was succeeded by Ronny Van Geneugden in February 2008, whose time at the club also proved fruitless. He was replaced by interim boss Pierre Denier who led the side to the Belgian Cup with a 2-0 victory against KV Mechelen, Hein Vanhaezebrouck was appointed as the new head coach in July 2009. However, he only lasted a few months before Franky Vercauteren arrived as his replacement. Vercauteren led Racing to a third league title in 2010-11 with a young players Christian Benteke, Thibaut Courtois and Kevin De Bruyne coming through from the proclaimed youth system at the club, before he departed for the riches of the UAE and the coaches job at Al Jazira Club. Mario Been came in as the new Genk coach, leading the club to the group stages of the 2011-12 Champions League and a fourth Coupe de Belgique in 2013 as Cercle Brugge were defeated 2-0. The 2012-13 campaign also saw Racing progress past the group stages of the Europa League before being defeated by VfL Stuttgart. Emilio Ferrera had a spell as head coach between February and July 2014, before Scotsman Alex McLeish arrived at the Luminus Arena for an unsuccessful term lasting until the end of the season. Peter Maes came in as his replacement as Genk failed to qualify for European football. Maes side progressed in the Europa League in the 2016-17 season before Albert Stuivenberg took over as coach in December 2016. The fine European run saw Genk top their group alongside Athletic Club, Rapid Wien and Sassuolo before defeating Astra Giurgiu. Genk eventually went out to K.A.A. 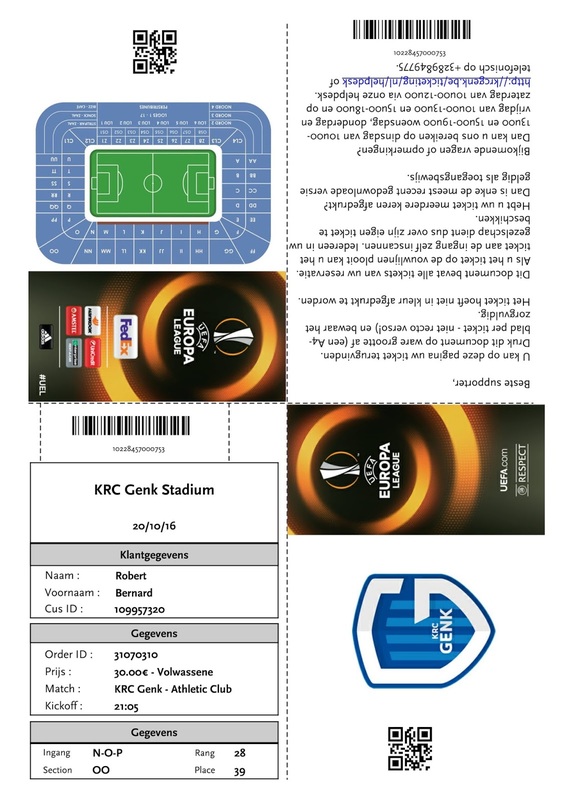 Gent in the Round of 16. KRC Genk will play in the Belgian First Division A in the 2017-18 season. My few days on the continent were into the second day as after a night out and morning around and about Brussels I took a train to Genk after a brief stop off in St Truiden. I really arrived with very little knowledge of my destination apart from it being a former coal mining town with a relatively low population. It wasn’t easy finding a room for the night so I plumped for somewhere nearer to the stadium at the Hotel-Brasserie Het Klooster for €57.50 for the night. It turned out to be a lovely place and the downstairs bar had a fantastic choice of local beers. It was a bit of a shame when it was time to head to the game. Some visitors from Bilbao were also staying at the same hotel and I began the walk round to the Luminus Arena with them. Once on the main Duinenlaan I headed up towards the stadium before grabbing some food at the vans outside. My ticket had been purchased in advanced and printed online for €30. I’m not sure whether it was the late 9.05pm kick off, the ticket prices or live TV coverage but the attendance was disappointing, although there was an impressive following over from Biscaya. Luminus Arena was a very impressive modern venue, which was obviously quite new. Three sides had continuous two tiers of seating. The two corners of the Main Stand had corporate facilities wedged between seating. The side had seating downstairs with corporate facilities above. Because of the low attendance, the stewards were relaxed. As a consequence, I moved to different vantage positions during the match. This was handy in the cold weather. A stadium card had to be bought for any purchases from the kiosks, so I gave it a miss. Genk looked a pretty decent side. I wasn’t sure what to expect from the standard of Belgium football, but they were certainly no mugs. Athletic came close on thirteen minutes when an Aritz Aduriz shot was just too high. Thomas Buffel had a decent shot saved for the Belgians midway through the half. Tino Susic also came close to giving Genk the lead before they went ahead five minutes before the interval when Jakub Brabek fired home from close range. Both sides exchanged half changes before the Swedish referee Stefan Johannesson blew his whistle for the break. Genk were just about value for their lead. Into the second half Athletic gave it their best, but they were forced back by the home side. Leon Bailey set up Alex Pozuelo saw a shot well saved by Iago Herrerin in the Bilbao net. Brabec then saw a header blocked as KRC went for the kill. With seven minutes remaining, they put the game to bed when Wilfred Ndidi made it 2-0 with a right footed shot from outside the box into the bottom corner of the net. Athletic countered with a couple of late attempts without being able to get past Genk custodian, Marco Bizot. At full time I grabbed some food as I headed back down the main drag. I was half tempted to pop into a local social club on the way home. However, I gave it a miss and headed straight back to my room so I could get a good rest before my journey to Dusseldorf the following day. At breakfast, my young host had got up and fed me royally. He was a Genk supporter and he took time to tell me about the merger as well as showing me some great old black and white photos around the wall from the old derby games and the mining heritage of the area. It rounded off my brief visit perfectly.